Wilcynski Partners is the best full-service real estate agency we have ever encountered, by far, in buying and selling half a dozen houses over 30 years. Every person in the office did exceptional work for us. We had a very good house to sell which, while structurally sound, had cosmetic issues. Other agents suggested that we address these issues ourselves prior to discussing listing the house. 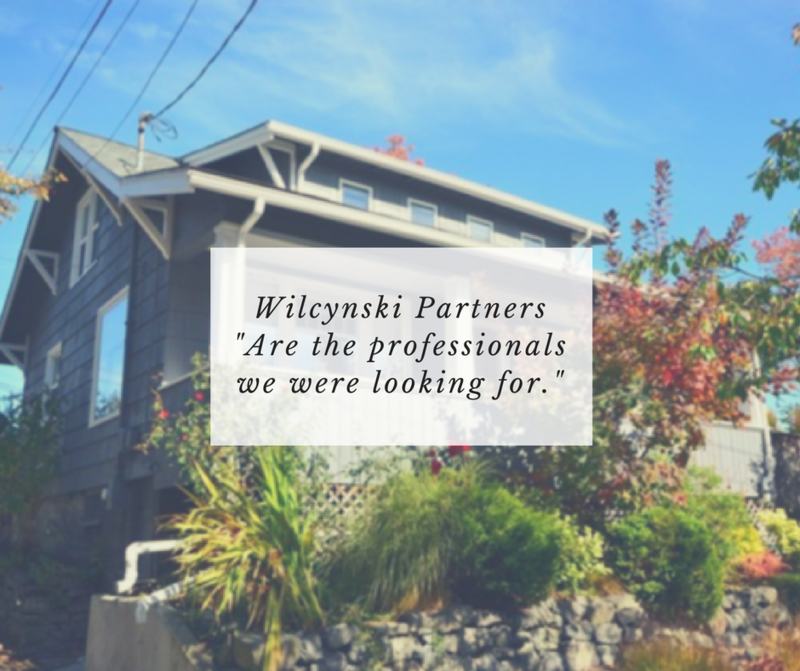 Wilcynski Partners took on the entire process of preparing and selling the house, with the highest levels of service and integrity at every step. They requested our budget for preparing the house, and accurately prioritized work for greatest return on investment. They then orchestrated a network of service providers to quickly complete high quality painting, floor refinishing, carpet replacement, cleaning, staging, and more, staying within budget. Once the house was ready, they helped us set pricing with analysis based on real data. 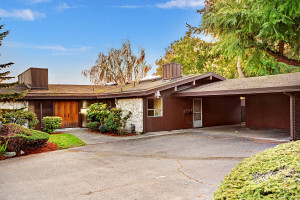 They presented the house with a brilliant and accurate listing, including professional-caliber photographs, and ran several open houses from which they prepared detailed notes accurately gauging reactions to and interest in the property. They provided expert guidance in choosing from the 9 above-price offers we received. Finally, they stayed on top of all issues all the way through closing. Wilcynski Partners accomplished all of this with us living two hours from the house. 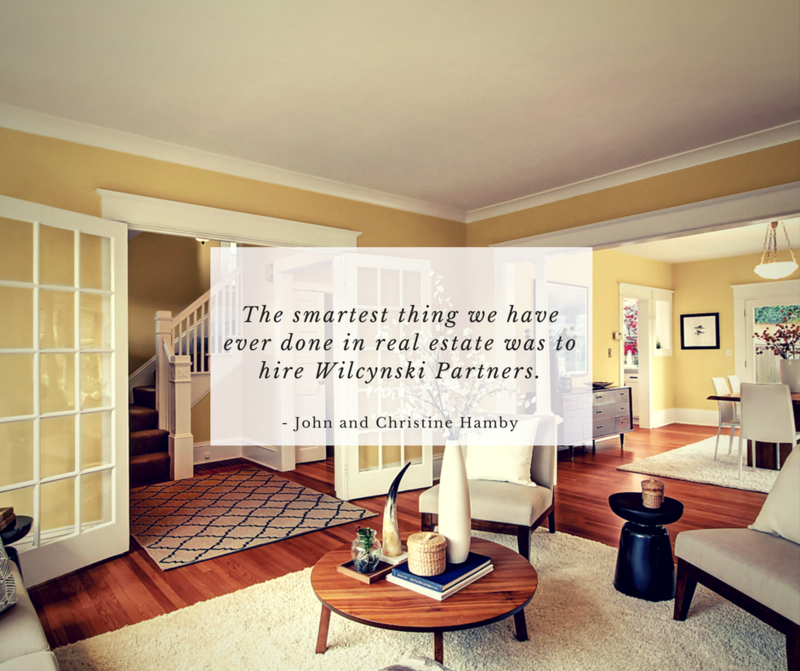 The smartest thing we have ever done in real estate was to hire Wilcynski Partners. Dan and his brother are the professionals we were looking for. Never once in our time together did I feel any pressure to make a decision. When I had questions (and I have plenty) he was very clear and patient in his explanations. I would (and will) recommend them both to my friends and family in the future without hesitation. Dan helped us find prospective homes, setup viewing times that were convenient for us, and helped us think through the pros and cons of each house. He then helped us feel confident when we were ready to make an offer. 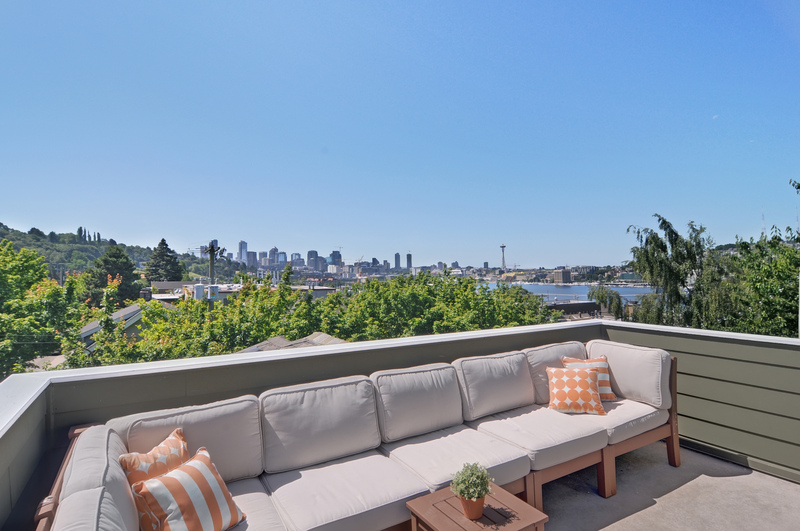 Having never bought a house in Seattle, the process of acquiring an inspection before putting down an offer was new to us, but he helped us negotiate with the sellers’ agent and we successfully outbid a number of other competing offers while staying well within our budget. Larry and his team are the absolute best! We enlisted Wilcynski Partners to help us prepare and sell our Ravenna bungalow and could not be more impressed by the service we received. The results speak for themselves: our house had 9 offers, and sold in 8 days for 33% over an already aggressive asking price. 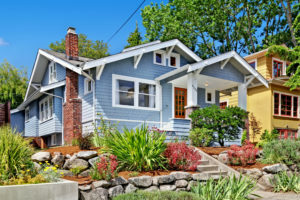 We had lots of well meaning friends suggest we go with a discount broker, or do a FSBO – but if we had, we would have left a lot of money on the table. Wilcynski Partners coached us through every step of preparing our house: they suggested optimum improvements, actively coordinated and managed all the subs, and then orchestrated a perfect level of staging. When they finished polishing the product, they marketed it with laser focus. The reality is that they did things we would have never thought of – and those things, that knowledge, made all the difference. Anyone who thinks real estate agents do not earn their commission in the internet age – simply have the wrong agent. Larry and crew are great people. They get amazing results. Hire them. 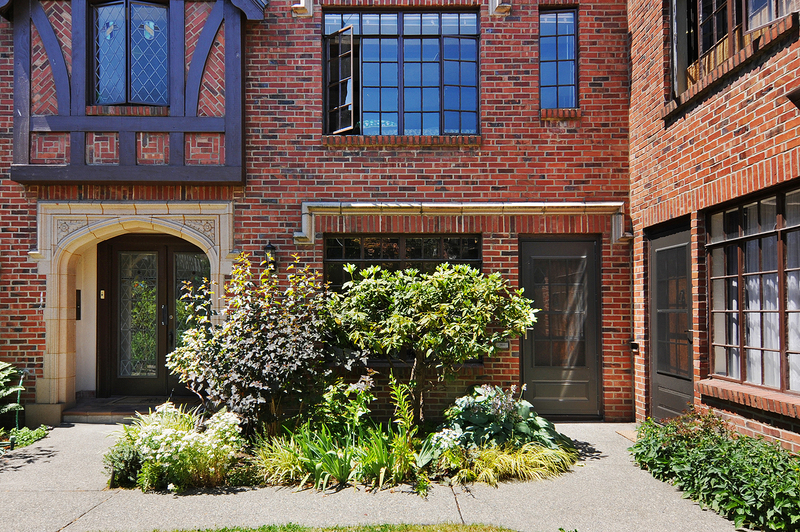 We interviewed several agents when we decided to sell our Seattle home this past July. 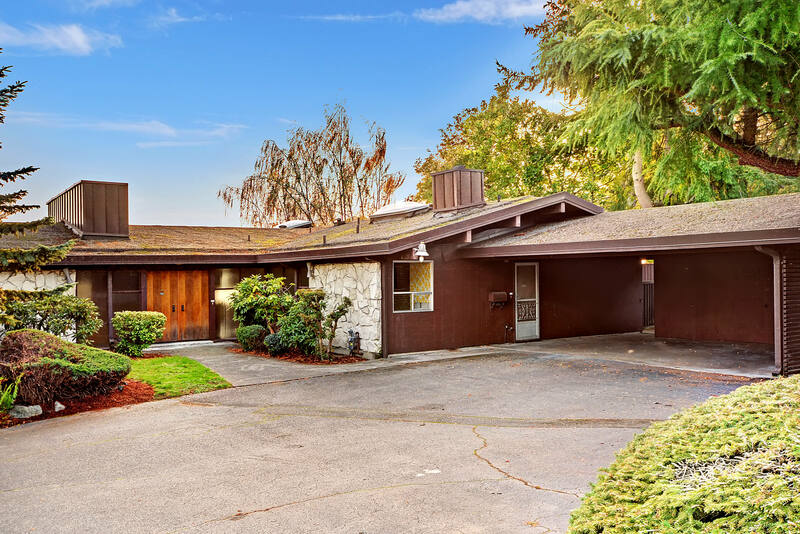 Larry and his team took the most time to look at our home and make recommendations for improvements, while other agents suggested only making sure the house was clean. 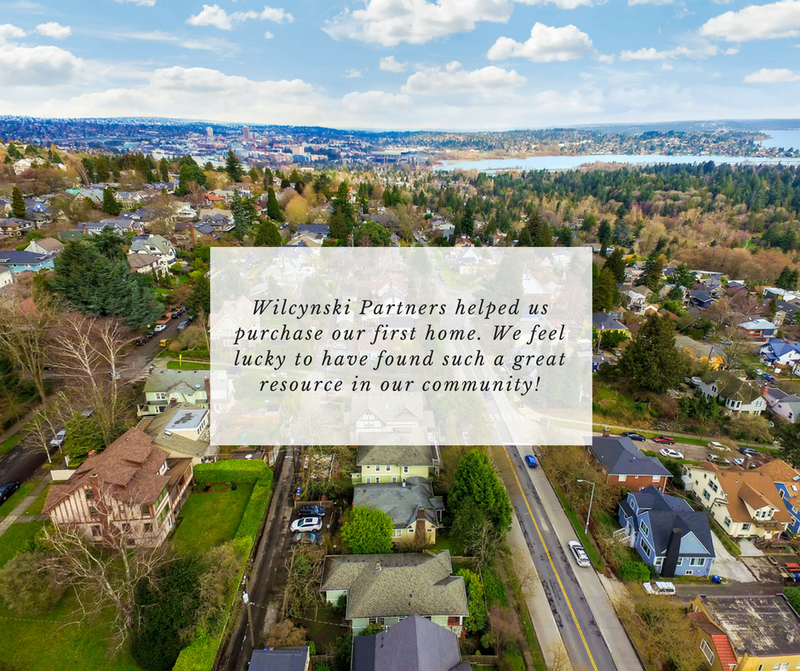 In this market, where agents can be very complacent, Wilcynski Partners takes the time to make sure every detail is addressed. They managed all the improvements and staging for us which was great since we don’t live in the area. Our house was on the market for 8 days and received 6 offers, two of which were cash, all of them well over asking price. We closed 9 days later. 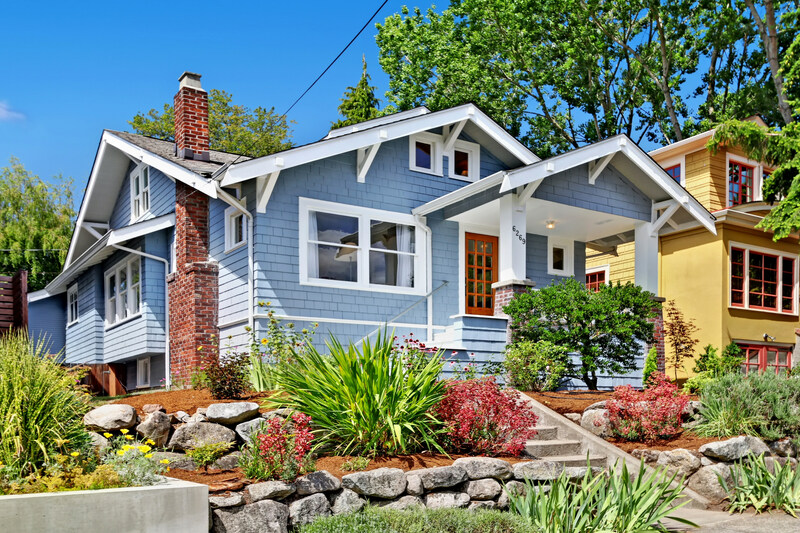 Selling your home can be a stressful experience, but they made it the exact opposite. We can’t thank them enough. Larry and the team at Wilcynski Partners are the VERY BEST. [Dan and Larry Wilcynski] sold our family house in Seward Park and it was S-E-A-M-L-E-S-S. They go ABOVE AND BEYOND for their clients and we were so grateful for this. Every step of the way we were completely informed and always felt that Larry and Dan were looking out for us. Larry was so knowledgeable of all aspects of the market and a master strategists on a constant endeavor to obtain the best situation FOR ALL…we loved that. Larry and Dan are amazing! They were with us every step of our home-hunting process, with timely responses, expert knowledge, and keen insight. Their strategic thinking and creative approach were very much needed as we purchased a great home, in an amazing location, in a very competitive market. And years later, they continue to be quick to share to home-related advice and resource. I’ve recommended Larry and Dan to several friends [who] are equally impressed. I would highly recommend the real estate broker services of Larry Wilcynski with Wilcynski Partners. In a recent transaction in which Larry acted as the selling agent of our unique property, I knew immediately upon meeting him that he would be a great professional to work with. He was encouraging and honest and gave us clear direction on the best course of action to take to ensure we would get the best selling price we could. I knew he was on our team and would be an excellent advocate for us. He was able to assess our situation with efficiency and care and he demonstrated a degree of confidence that enabled us to fully trust that he was going to work as hard as he could on our behalf. He has great listening skills and is VERY responsive. 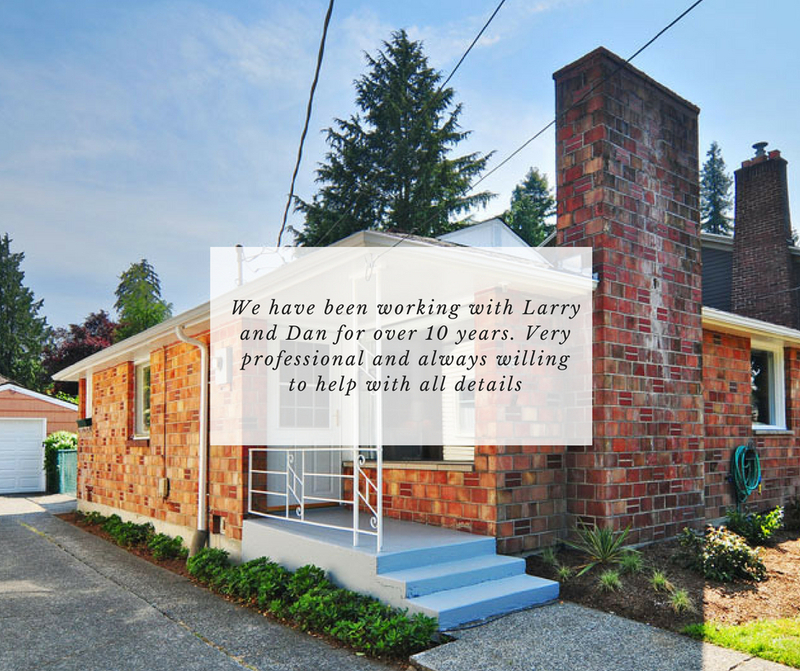 From determining the price, to staging, to accepting an offer, to negotiations to closing, Larry was present and engaged in every step along the way demonstrating that he really loves what he does and is really great it. I can happily give him a 5 star “as good as it gets” rating! Wilcynski Partners helped us purchase our first home. They were so responsive to our questions (and more questions! 🙂 ) and took the time to explain the implications of each decision along the way. They’ve worked in the area for years, and their knowledge and expertise really shows. We feel lucky to have found such a great resource in our community! I am a professional RE investor. I have done close to 30 transactions in the past 20 years with several RE agents. I had a chance to work with Larry with my last (and biggest) transaction. He is the best! Professional, knowledgeable and not pushy. There was a long negotiation involved and I felt Larry handled things very well. Not once did I feel that Larry wanted to get things over with so he could get paid. I felt Larry was looking out for my interests at every turn and as we got approached closing, the focus sharpened. I would fully recommend Larry for any RE needs (residential, multi-family or commercial). I really enjoyed working with Kristina – she is personable and down-to-earth but also professional and got me just what I wanted! She got to know me and guided me towards homes I would love! We have been working with Larry and Dan for over 10 years. First time was selling our house after letting another agent go. The house sold for a higher price within a few days. Very professional and always willing to help with all details. We worked with Larry and Cassandra as a team. Larry was our lead contact. He and Cassandra worked together in a way that gave us full support throughout the process. Whenever we had a question or concern, it was addressed the same day. We needed some contracted support work since we went to market–and then to closing–in a short period of time. Larry and Cassandra helped us find and schedule all the work (cleaning, painting, landscaping, minor repairs) that we needed. The service providers all were good to very good. 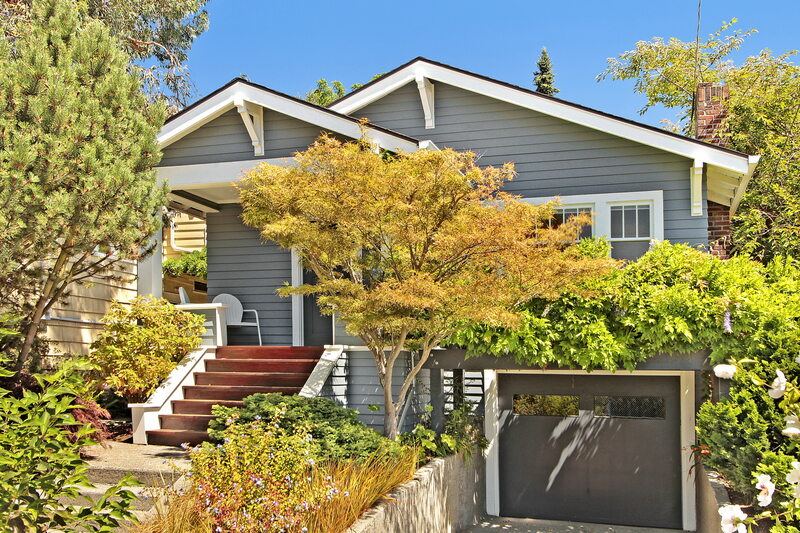 The advice we got about preparing our home for showing, pricing, and close out/move out procedures guided us to a successful transaction in which both buyer and seller were happy. In Larry and Cassandra, we had a professional team that also had the backup support of the rest of the Wilcynski partners. We highly recommend this team. 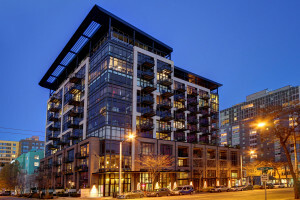 Larry Wilcynski worked with me over a period of two years to identify the best time to sell my luxury condo in Seattle. He is patient, professional and has a great sense of all facets of the Seattle real estate market. With Larry consistently producing the most up to date comps, we decided to list the condo in Fall 2015. His advice on the listing price was spot on: we had offers within the first month and sold in the second for the right price. Since I live away from Seattle, I relied on Larry and his team for many things: staging advice and coordination, small repairs, paperwork, and the like. They did a fantastic job overall in promoting and showing my unit, providing me with detailed, weekly reports. Larry also made himself available to me, sometimes on a daily basis, for advice and consultation. I *always* had the feeling that he was working to get the best results for me, and not only for his commission. Having worked with a number of realtors, I can assure you that this is not always the case. The results speak for themselves. I cannot recommend Wilcynski partners highly enough. 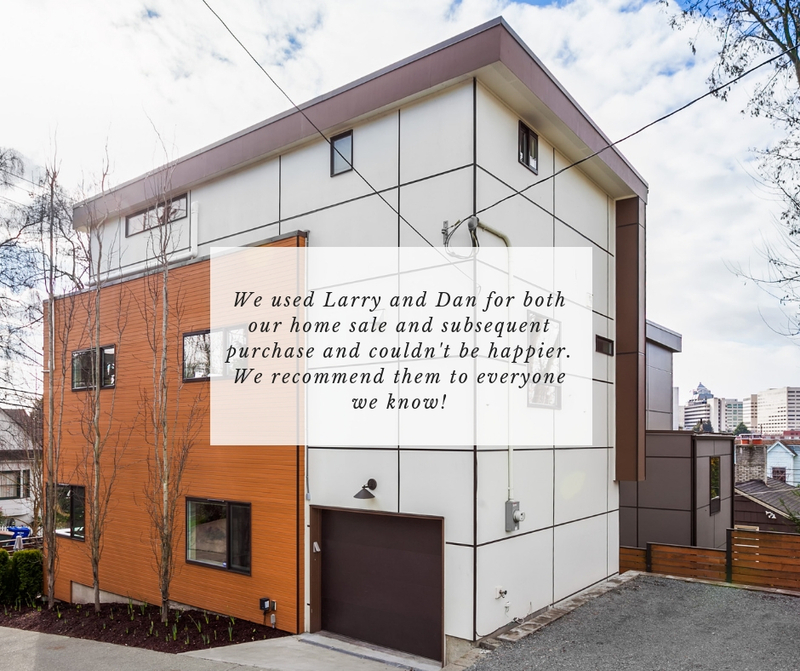 We used Larry and Dan for both our home sale and subsequent purchase and couldn’t be happier. They know the market and worked hard on our behalf to broker the best deal for both sides. Their professionalism, attention to detail and negotiating skills are superb. We recommend them to everyone we know! Larry and team are fantastic! 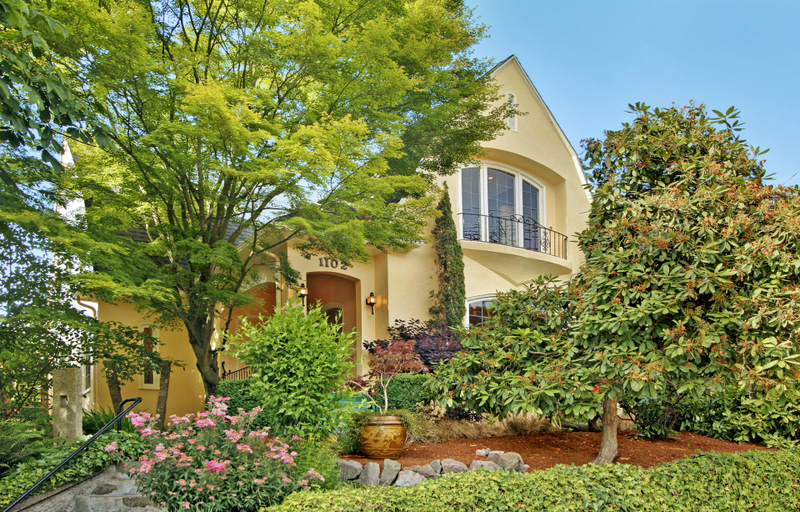 We had to sell our parents’ Seward Park home which was a very complex transaction with several different selling strategies that we had to consider. The property needed quite a bit of work (hundreds of thousands of $$) and was large enough that it could have potentially been subdivided and developed. We chose Larry because he had significant experience with both residential and development types of properties. Larry’s team managed the process of getting bids for repairs and walked us through the pros/cons of selling ‘as is’ versus developing the property. He managed the processes of cleaning and preparation for the showing. At open houses, his team invited families/agents as well as developers and ended up with multiple bids. 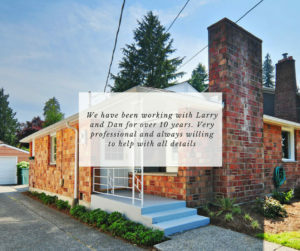 Larry was proactive and always available throughout the entire process. We highly recommend Larry! Working with Cassandra to sell our first home and buy one that would fit our growing family was a fantastic experience. We had so many memories in our original home, it was difficult to let go of. She helped us find a newly remodeled home matching our needs as well as our wants. Cassandra was patient with us as we walked through various homes trying to find the perfect one for our family. She was diligent and thorough, trying to match us with the home we would raise our kids in and create new memories. I highly recommend Cassandra’s professionalism, knowledge of the market and most of all her kind nature! Understanding the situation – I had difficulty vacating renters. Larry provided me with support during that stressful time. Guiding me well on marketing – Larry researched the market well for the area, conducting and updating the comparable study for us to reach a reasonable selling price. Secondly, I hesitantly followed his advice on staging. 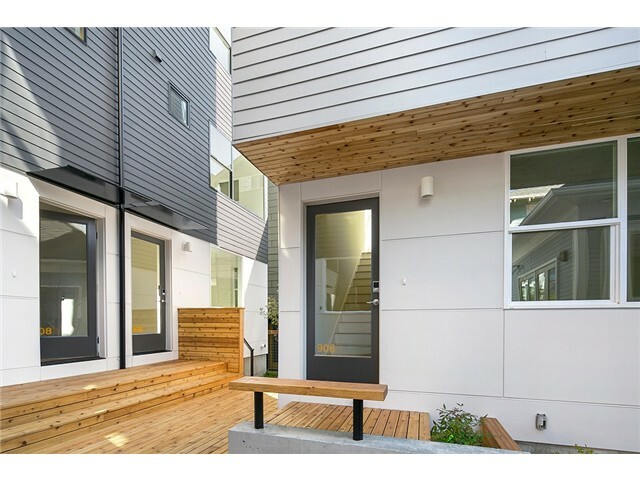 And damn, the photos came out beautifully which helped with the showing (it contributed to the condo being at the top 10% of “favorites” on Zillow). Listening to me on things I could not do – I felt Larry listened and accepted some of my constraints and limits. Helping me to manage my stress during the sale process – Having multiple offers is akin to a devil in disguise – so much can go wrong (that was what it felt like). Larry was always available to answer questions. And if not, his brother Dan was his back-up. I could have, but never felt lost. Closing the sale with no loose ends – once the disclosure document tornado settled, the escrow paperwork went smoothly as expected. Whatever Larry did to facilitate this, it happened. A friend who owns a unit in the same condo was so amazed, she said she would hire Larry when she is ready to sell. Call Larry right now. Working with Cassandra and Larry at Wilcynski Partners was an amazing experience! We knew we were going to sell our home, but it was likely going to be a bit if time before we were actually ready. Cassandra gave us an amazing listing presentation to help set our expectations and give us some suggestions on things to do as prep before we were going to list. We stayed in touch for the next few months and even checked in on the market to see how things were going. When we finally decided it was time the organization of it all was just top notch! My husband and I are working parents with a toddler and I felt like Cassandra took care of every detail to ease the stress of it all! 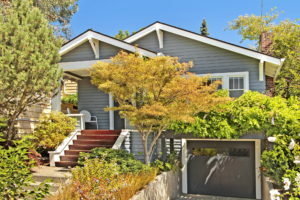 We followed all their recommendations to prep the house for listings and felt comfortable with the price at which we listed (based on their recommendation). We were able to accept an offer after 4 days! The days after the offer was accepted were a bit crazy, but Cassandra was giving us updates all the time and explaining exactly what everything meant and guided us through the process. She also coordinated all the inspection updates which saved us a lot of time and hassle! If ever there was a question or clarification Cassandra was on it with a quick and detailed response to reassure us that everything was on track! I highly recommend Cassandra and the Wilcynski Partners! Larry and Dan are excellent realtors. 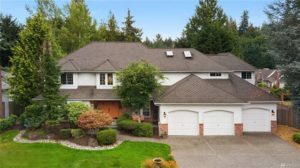 They offers outstanding support throughout the listing and sales process including coordinating work to maximize a home’s potential with a network of top notch professionals. 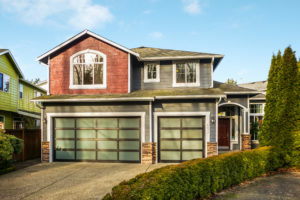 In the competitive Seattle market we found this network of contractors and their knowledge of the current market crucial to getting our home in excellent shape and listed quickly. 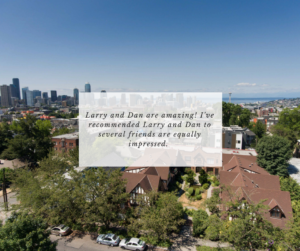 Larry and Dan are very professional, gave us practical advice every step of the way, are proactive in providing status updates, and basically made the difficult process of selling a home as easy as possible. 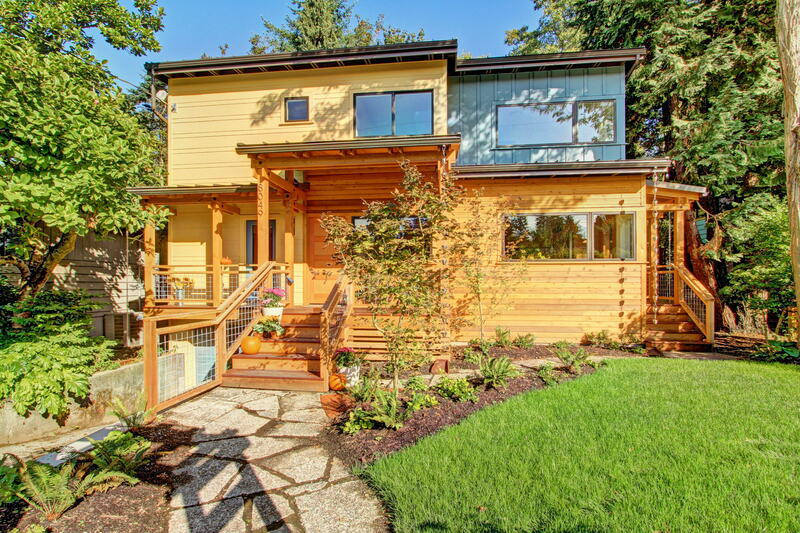 If you have found the house of your dreams and want to do whatever you can to make it yours, Dan will get it done. Throughout our homebuying experience Dan was in constant contact with the sellers of the house we eventually purchased, able to convince them to extend for over a month while the buyers of our current house had to delay to get their financing in place. Dan showed a level of care that made me truly feel like family. We will be forever grateful for all the work he did for us even after the purchase of our house. 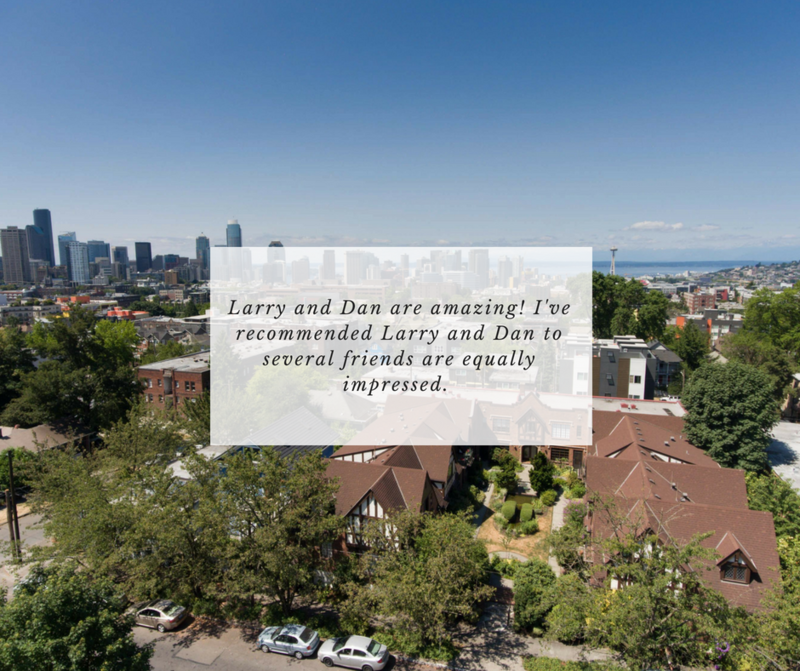 Dan and Larry are excellent realtors. They work well together and back each other up so they are always available. They make a great team! 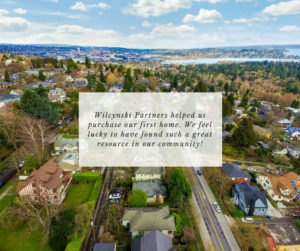 I highly recommend using the Wilcynski Partners when buying or selling a home. I worked with Dan and he was incredibly helpful throughout the whole process of finding my home! I love the house Dan helped me find! 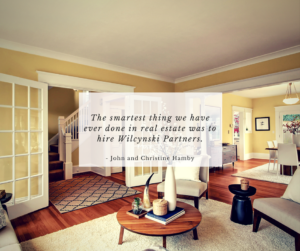 Next time I buy a place, I will for sure be working with Wilcynski Partners again. 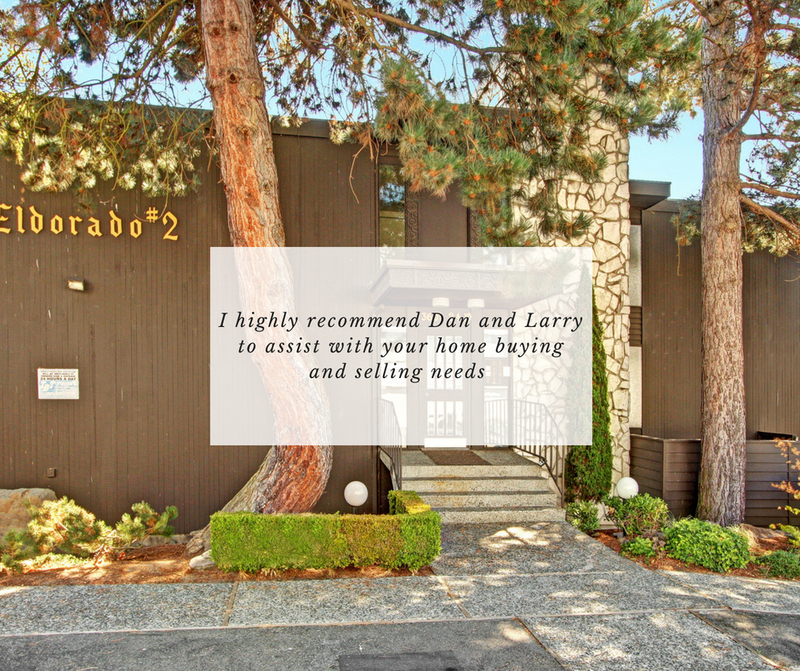 I highly recommend Dan and Larry to assist with your home buying and selling needs. Dan helped me buy my first condo 6 years ago and the purchase was smooth. And now their team made the sale of my condo so easy while I am 2200 miles away in Texas. I closed today! Their professional advise and knowledge of the Seattle area market was invaluable! Huge kudos to Dan, Larry and Cassandra! The Wilcynski brothers (Larry and Dan) and Cassandra Stoneberg were very easy to work with for the purchase of my first home. Their professionalism and real estate knowledge was what ultimately enabled me to purchase my home at the best price possible. Because of the Wilcynski Partners, I was able to get the keys to my first home with some instant equity. I couldn’t be happier with the house I ended up with! Thank you Larry, Dan, and Cassandra. Larry Wilcynski is a consummate real estate professional. I would highly recommend both him and Wilcynski Partners if you are considering selling a property. Larry made every part of the process run smoothly, clearly explained available alternatives and went above and beyond in getting the transaction closed in a timely and efficient manner. As first time home buyers, we had a LOT of questions and anxiety about buying our first home. Dan helped us navigate the process with ease by thoroughly answering our questions with great recommendations and insights. 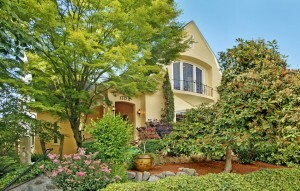 He was super responsive, a great communicator, and helped us purchase a beautiful home in a highly competitive market. We can’t recommend him highly enough. I highly recommend listing with Larry Wilcynski! He provided a comprehensive market overview and marketing plan to sell my townhome. He was incredibly responsive and while offering sound advise, he also gave me enough room to interject my own judgment. 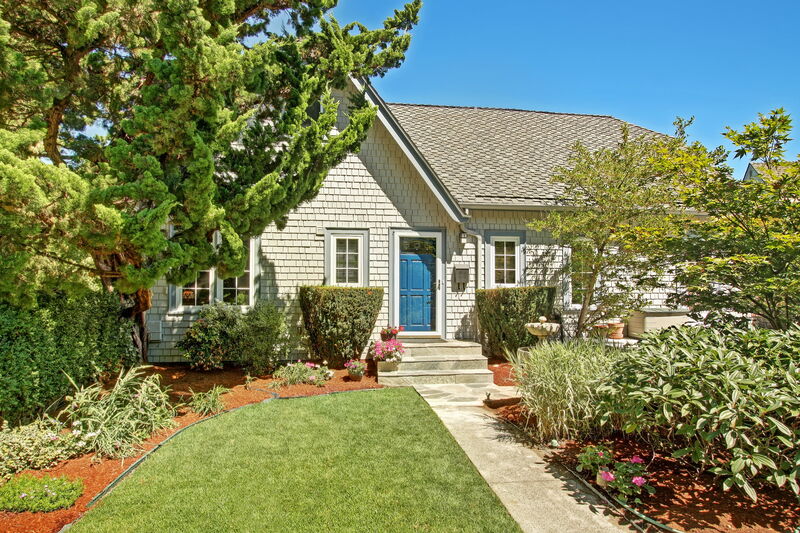 A year ago, my partner and I decided it was time to launch our retirements and the first step in the process was selling our home of twenty-three years. We needed a good amount of the “soft” requirements for making such a momentous change – support, encouragement and guidance. More pragmatically, we wanted a realtor who demonstrated peak knowledge of the rapidly changing housing market, demonstrated an appreciative grasp of our unique neighborhood and would present a bold and aggressive marketing plan to assure our home had the edge and good appeal from the moment the listing opened to the public. 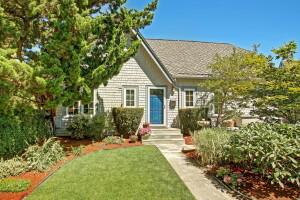 Six days after listing our home, we had a wonderful offer which we accepted and the sale closed about a month later. My partner and I then left for a five week celebratory trip into our retirements! We could not have been more pleased. We cannot recommend Larry and Dan Wilcynski more highly as realtors. 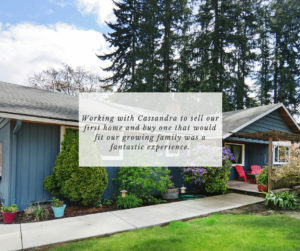 The two of them met with us regularly, were always available when we contacted them, answered our concerns and questions promptly and honestly, and took great care of our home (and us) through the open houses and the multiple anxious moments that are part and parcel of selling one’s home. Somewhere along the way, we couldn’t help but feel as though Larry and Dan had become trusted friends who knew us well, understood the unique qualities our home offered, including its historical value and community presence, and genuinely wanted us to get the very best price that was out there. I have found that providing a critical comment or two adds legitimacy to a reference, but in truth, I cannot think of a single change to recommend to the Wilcynski Partners or a solitary caution to mention to their future clients. Our experience of them vouches for their professionalism, knowledge, marketing skills and the personal touch that made the entire process a success and dare we say, pleasant.